The Haunting has state of the art sound and effects, and if this is well mixed with a good story, you`re in for a treat. But this is not the case when it comes to The Haunting. The story is adapted to the visual effects, and not the other way around. This is too bad, because The Haunting could easily (with a little creativity)have become a very exciting and creepy movie. Don`t misunderstand me. I don`t think it`s a bad movie, and i was blown away by the sound and cool effects, but the most important thing outstood,- it wasn`t frightening, and the ending was very little surprising. Anyway, it is well worth a look, and it is entertaining, but don`t expect a horrormovie, because it aint. 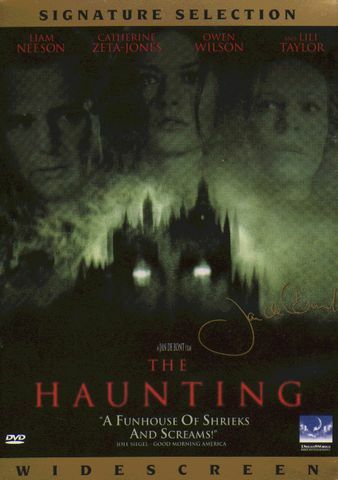 The Haunting also contains two trailers and a documentary hosted by the lovely Catherine - Zeta Jones, which also deals with other haunted houses etc. Interresting. The picturequality is excellent, and the movie is charming and entertaining. The Haunting gets a 4.